There are few accessories that anyone from an oil platform engineer to a home mechanic can use, that are as cool as the infrared thermometer. It can tell you the temperature of an object or a person, without even touching it. Sadly, it only measure skin temperature, so it may not be so useful to parents thinking that they have found the easy way to take their children’s temperature. On the other hand, however, it is the perfect tool to have in your car to check anything from the temperature of your disk brakes to that of the engine. Of course, mechanics and engineers will have even a better use for it, checking the temperature of the various instruments they work with daily. So, we decided to create the following top 10 best infrared thermometers of list, for those of you who need one and are not quite sure which one to pick. Make sure to scroll past the list to our in depth reviews in order to get the most important details about each device and make up your mind if it is worth the money. 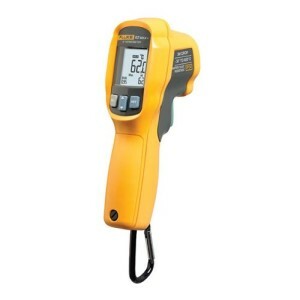 The Fluke 62 MAX is the most loved infrared thermometer on the market today with a 4.5 star rating on Amazon from more than 60 customers. All those customers are right to love it: it has a very rugged construction and an outstanding level of performance. We were actually impressed to discover that such an advanced piece of technology, with a built in laser and a back light screen, can stand a fall of 10 feet without any problems. Not only that, but it is also water and dust proof and it has an official IP54 rating for that. It can measure temperatures from -20 degrees Fahrenheit to +932. You can use it in multiple settings from monitoring electrical systems to HVAC and automotive machines. The fact that the screen is backlit means you can actually easily read the temperatures even if you are taking your measurements in bright daylight conditions. The built in laser is very useful in allowing you to perfectly pin point the area where you need to get the temperature from, but you have to remember the fact that it has a 10:1 distance to spot ratio. That means the Fluke 62 MAX will measure the temperature of a 1 inch radius spot around the laser pointer spot for every 10 inches you add in distance between the two. Luckily, the thermometer will display the highest temperature and the lowest temperature recorded and you can judge from that the actual temperature that you are interested in. There is very little else we can say about the Fluke 62 MAX Plus since it does not differ that much from the Fluke 62 MAX. The one reason why they decided to come out with the Plus is because they were able to increase the maximum temperature reading from 932 degrees Fahrenheit to 1202 degrees with an accuracy of +/- 1 degree. Even more interesting is the fact that the Fluke 62 MAX Plus uses a dual laser system that simply creates a circle around the measured area. That way you do not need to concern yourself too much with calculating what the measured area is, and you can easily tell if the lowest and highest temperatures displayed are both coming from an area of interest or not. We were actually impressed to see that the backlit display is even better than the one on the Fluke 62 MAX and that it is a lot easier to read. 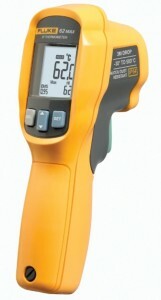 There is just one other infrared thermometer on the market that has earned a higher rating than the Fluke 62 MAX, and that is the Mastercool MSC52224A. It has earned a 4.7 star rating on Amazon from more than 200 customers, but it is in a completely different, much lower price range and the expectations for such a product are much lower. Still, we were fairly impressed with the Mastercool MSC52224A’s ability to measure temperatures between -58 and 932 degrees Fahrenheit. It has a bigger distance to spot ratio, of 12:1, and in case you did not do the math, bigger is actually worse here. It feels very sturdy in the hand and it comes with an equally sturdy carrying case, but it may not survive a fall even from 5 feet away, so we recommend extra care when handling it. The Kintrex IRT0421 is a slightly more affordable variation on the capabilities of the Mastercool. Besides the price, the other impressive difference is that the Kintrex IRT0421 can actually measure a temperature between -76 and 932 degrees Fahrenheit. Furthermore, it can give you an accurate read in less than a second which is quite impressive given that, even the more expensive Fluke infrared thermometers take 2 to 3 seconds to give an accurate read. Still the Kintrex IRT0421 does not feel as sturdy as the Mastercool and it only comes with a belt holster. Then again, given how inexpensive it is, you could risk carrying it with you anywhere you want and just buying one with you when the inevitable accident will happen. 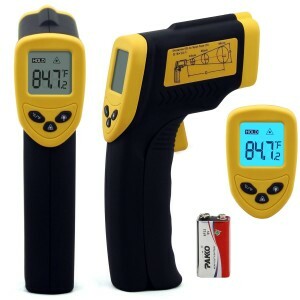 If you want to go even lower with the thermometer’s price, and you have a couple of batteries, you could go for the AR550 Mini Infrared Thermometer. It measures temperatures between -26 and 1022 degrees Fahrenheit with an accuracy of 2%. 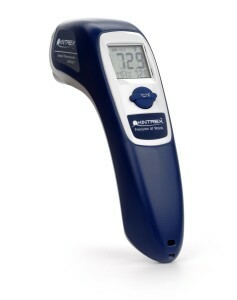 Given that it is almost 3 times cheaper than the most expensive item on our list of the best infrared thermometers of , we would have to say that this is a pretty good deal. Interestingly enough, the AR550 also feels like one of the sturdiest affordable thermometers here, but we would not risk dropping it from 10 feet away on a hard cement surface. 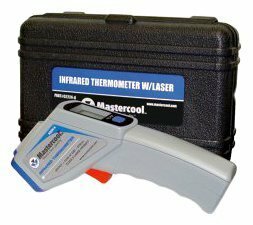 There are two things that create an irresistible pool towards the TopG Non-contact Infrared Thermometer: one is that it is an incredibly cheap item that does come equipped with a laser pointer so you know exactly what it is measuring. And the second thing that really impressed us was the fact that it comes with a life time warranty. That makes it almost an equal to the Fluke Infrared Thermometers, because, just like them, it will last you a lifetime regardless of what you do to it. 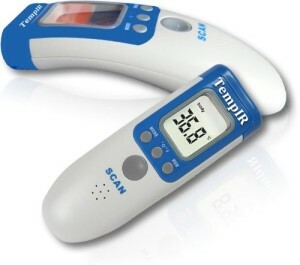 The most important thing to understand about the Tempir Body Temperature Thermometer is that it is not as precise as the more traditional thermometers. On the other hand, it is also not as intrusive and it will not bother your baby at all when you use it. Obviously, being a body temperature thermometer, it does not have the range of other thermometers, but it does have a memory function and you can store the last 32 temperatures taken. The one thing that we recommend is to point it at the baby’s year and choose the highest temperature it shows from 3 separate readings. 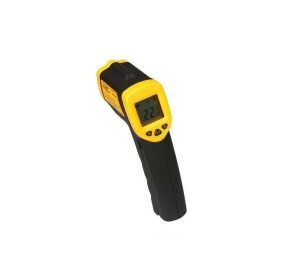 We saved the cheapest infrared thermometers for the last 3 places on our list. The Nubee is the best of the cheapest ones. 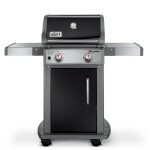 It has an accuracy level of -/+ 2 degrees and it measures temperatures between 58 and 716 degrees Fahrenheit. Interestingly enough, for such an entry level product, it comes with its own 9V battery. The one thing to point out here is that a 9V battery is much more powerful and will last more than the double AA batteries that all of the other infrared thermometers work with. 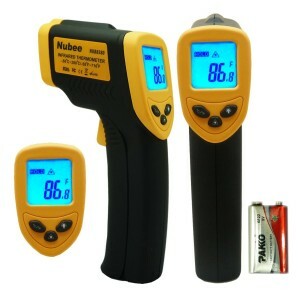 The only problem with the Nubee infrared thermometer is that it only measures temperatures up to +716 degrees Fahrenheit, so you may want to go with the BAFX Products thermometer simply because it goes as high up as +1022 degrees and as low as -58. 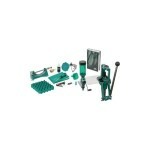 It also has a built in pointer so you can be sure of what you are measuring. Even more impressive is that, despite the fact that it costs just under 20 bucks, it has earned a 4.4 star rating on Amazon from almost 300 customers. 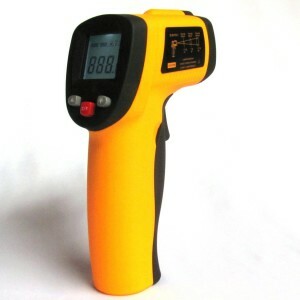 The last choice we have for you on our list of the best infrared thermometers of is the Etekcity® DT-8380. It is one of the cheapest products on the list, so, as you would probably expect, it can only measure temperatures up to 716 degrees Fahrenheit. On the other hand it does have an auto shut down function, a laser pointer and a data hold function. 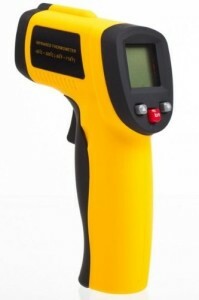 So it might just be all you need out of an infrared thermometer.